Review: Similar to Big Little Lies, Three Wishes opens with a 'scene' and then goes back in time working toward the event. Unlike BLL, the event here wasn't as shocking as a murder. It was a set of triplets fighting at a birthday celebration. 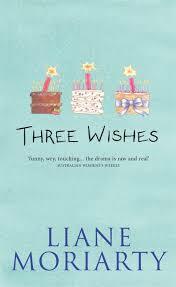 The book basically follows a set of triplets as they navigate family, friendship and life. Moriarty is a skilled writer and definitely kept me engaged and interested in the story. While I was interested in the triplets, I couldn't help feeling like that plot itself was a little thin. Overall-this was a fun read and would be perfect for the beach or vacation.